> An alleged drug trafficker who is suspected of throwing a suitcase full of cocaine out his hotel window in a fit of paranoia has links to a notorious Irish crime mob. An alleged drug trafficker who is suspected of throwing a suitcase full of cocaine out his hotel window in a fit of paranoia has links to a notorious Irish crime mob. 15:04 | An alleged drug trafficker who is suspected of throwing a suitcase full of cocaine out his hotel window in a fit of paranoia has links to a notorious Irish crime mob. An alleged drug trafficker who is suspected of throwing a suitcase full of cocaine out his hotel window in a fit of paranoia has links to a notorious Irish crime mob. The 39-year-old suspect was arrested in Valencia, Spain at the weekend after a receptionist spotted the drugs scattered over an internal patio. The man was caught with a second suitcase packed with cocaine outside his room after he allegedly went looking for the drugs and then asked for a duplicate key when he found himself locked out. The Irish Mirror has learned the suspect is originally from West Dublin and has links to drug importer Brian Grendon, 37. Grendon was jailed for five years in 2002 after he pleaded guilty to his part in a heroin deal worth nearly €2million. Sources have said the suspect for this latest incident will be now living in fear after losing 55kgs of the drug worth over €3million. The Irishman was expected to be remanded in custody on Monday following a behind-closed-doors hearing before an investigating magistrate. The bizarre incident happened last Friday night just before 10pm at the four-star Tryp Valencia Oceanic Hotel in the city of Valencia on Spain’s east coast. 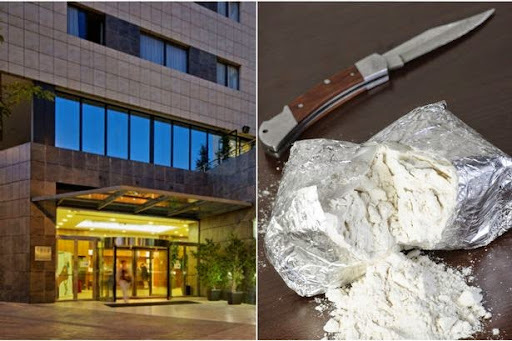 Police are said to be working on the theory the suspected drugs trafficker, who had checked into the hotel a few hours earlier, confused noise from other guests entering and leaving their rooms with a rival gang trying to steal his drugs after suffering an attack of paranoia. He had also removed ceiling tiles in his room - room number 801 - along with an air conditioning vent in an apparent attempt to hide his illegal stash.